The air is poison, the climb is steep, and there’s a lake of sulfuric acid in the center of the caldera. Photography can be a little difficult in the precipitous craters and noxious gases of Java’s Ijen. Volcanoes, it turns out, aren’t great for drones. On my trip to this curious Indonesia sight – a collection of composite volcanoes in yellow and white – I would find one of the most alien places I have ever visited. To film the Ijen volcano complex turned out to be more difficult and more rewarding than previously thought. ABOVE: Filming in Ijen was challenging, but well worth it to experience the most alien place I had ever been. The five-hour train journey to Banyuwangi was on a bog-standard public train, though the view of Java passing by was pleasant enough. The train would take me to my eventual – though brief – resting place of Ijen Resort and Villas. It stands in stark contrast to the sharp ridges and alien topography of my Ijen destination, a bit reminiscent of Bali. ABOVE: Verdant fields of Java. Despite the lifelessness of Ijen, the surrounding area is much like what one would expect from the tropics of Indonesia. The surrounding area includes the bucolic mountains of the Kawah Wurung and the seemingly hairy trees of Benculuk Perhutani. But it is with the cruel, otherworldly sights of Ijen with which most visitors are enamored. With a turquoise lake of extremely acidic water and belching yellow sulfur streaming from rock, Ijen is one of the strangest natural sights in all of Java. However, it was by forgoing one of the most popular attractions, the blue fire, that I was able to get such spectacular shots in relative peace and solitude. Travelers hike for two hours in the early morning hours to see the blue fire, ignited sulfuric gas that burns at up to 600 degrees Celsius. What many don’t know however, is that they’ve only got about a 30 percent chance of seeing the blue fire – missing sunrise from the heights of Ijen. ABOVE: On the ridge of Ijen. Instead of waking up at 1am, we chose instead to sleep in an extra hour and a half before driving the 45 minutes to Ijen. It was a steep but convenient two-hour climb to the top, but travelers should be aware that, even though it’s Indonesia, it’s pretty chilly. The early hour and the altitude mean that travelers need to pack a little heavier than they might expect for the tropics. ABOVE: The lake of acid and yellow sulfur from Ijen’s caldera. As most early morning travelers were down in the crater searching for blue fire, the rim of Ijen’s heights was relatively empty. The drop is sharp and the scenery dramatic, especially when experienced alone. Windy and cold on the volcano’s edge, flying the drone was a little difficult but manageable. ABOVE: A plume of gas emanating from the poisonous Ijen crater. We arrived at the rim of the crater just as the sun was coming up, and luckily the masses of tourists were down trying to see the blue fire. Above the sulfur lake and early morning chill, the air was clear, clean, and ideal for photography. We had coffee we had prepared beforehand on the rim. As the masses of tourists made their way up to the rim of Ijen, we went down. The number of tourists in the crater went from around 100 to zero. We were the only ones in the strange, alien world of the Ijen caldera. ABOVE: On the descent into Ijen’s crater, clouds of gas floor the senses. The hike down was not as easy as the hike up to the rim due to one main factor: sulfur fumes. The gasmask doesn’t always help, and the world around you would go from clear to cloudy in seconds. Occasionally, I was forced to bend over and close my eyes and try not to breathe. A few minutes later, it would be clear again. ABOVE: A laborer drags away a chunk of Ijen sulfur. They can carry as much as 90 kilograms at a time. Down there, though, in that seemingly inhuman world, people were working. The mining of sulfur is a major moneymaker for the local laborers, and it’s one of the hardest jobs in the world. Discounting the poisonous air – a hazard some workers braved with nothing more than a cloth around their face – these brave souls load up 90 kilos of sulfur in woven baskets. They tolerate tourists, who are often nice enough to give them some money for their poses, but they are there to perform a job – a job for which they are paid only a few dollars a day. ABOVE: Some laborers don’t have gas masks, using only a towel to keep the sulfur from their lungs. Pipes are used to smash the yellow rocks from the side of the mountain. Some of the sulfur collects on pipes and barrels put in place oxidize the deadly noxious gas. From there, these laborers put the baskets on the pipe and the pipe on their shoulder and trek it up the unforgiving crater. It was the least earth-like place I had ever been. 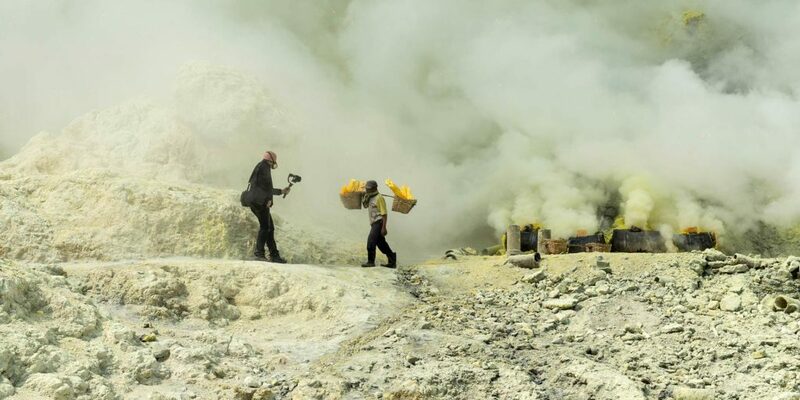 ABOVE: The arduous labor of pulling sulfur from Ijen pays only a few dollars a day. What makes the yellow rock so visually appealing, however, is its juxtaposition of the blue water of the crater’s lake. It looks peaceful, serene. But, it is, in fact, deadly. With a PH of just 0.15 in some places, this is the most acidic large lake in the world – so acidic in fact that it leaks into nearby tributaries and poisons them with its acid. ABOVE: Pipes and barrels are put over areas spewing sulfur gas in order to oxidize and collect the chemical. After only a few moments of contact, it can burn skin. I was told during my time there of an Indonesian man who went out on a raft in this one-kilometer long lake; others have done so to get PH readings from its center. With the sun climbing higher in the sky, the lake looked beautiful indeed. ABOVE: Yellow sulfur on the turquoise lake of acid. The dust and gas of the crater dried out my equipment, an extremely unfriendly place for photography. It dries on everything. After an hour and a half filming, I was ready to get out. Travelers should be warned that getting out is the hardest part of the journey. The choking sulfur and the gas mask make breathing difficult, restricting it to about half its normal capacity. Despite the trying nature of the journey, my only lingering problems were coughing fits that evening and a little dust in my drone’s gimbal – a small price to pay to visit another planet, and certainly a smaller price than those who brave the crater every day. Bright yellow sulfur, gray volcano rock, and a gorgeous, deadly blue pool of acid – that was Ijen.